Miss Meredith Sweetpea encountered a manners dilemma the other day when dining out in a restaurant when her dining companion proceeded to stack the dirty plates and push them to the edge of the table following the meal. 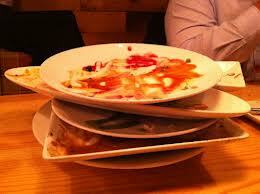 When you stack your dirty plates, are you helping the waitstaff or committing a manners infraction? According to Judith Martin, “Miss Manners” herself, it is bad manners to stack plates for the wait staff to remove from the table. In her words, “Miss Manners knows that you were only trying to help. A waiter who takes pride in his professionalism would never stack plates at the table, and could be in trouble if you made him appear to have done so.” Make it a practice never to scrape or stack your plates at the table. It is aesthetically unappealing, dirties both sides of the dishes, and could damage the dishes. When you are finished with your meal, do not push your plate away from you or stack your dishes. Place your knife and fork together in the “twenty minutes past four o’clock” position, picturing your plate as the face of a clock, with the knife on the outside, or place your used utensils side by side in the middle of your plate, fork to the left, knife to the right with the sharp blade turned inward toward the fork. Keep your napkin on your lap until you rise from the table. Upon leaving the table, fold up your napkin loosely and place it to the left of your plate. Do not refold it. Nothing is more pleasant than sharing a good meal with good friends. Good etiquette only makes the experience sweeter. Read more by Judith Martin. 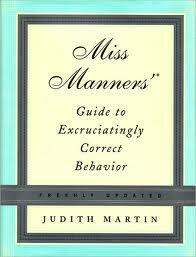 Order your copy of Miss Manners’ Guide to Excruciatingly Correct Behavior here. As a server I like it when people stack their plates. Two messy stacks is easier and faster for us than an entire table. Please stop telling people to not stack plates. PLEASE STACK YOUR PLATES! Thank you for your comment. Miss Meredith Sweetpea at one time worked as a server herself, so she understands the dilemma and hard work of serving and removing plates. In this column, however, she is attempting to provide gentle reminders of good manners, and even if stacking of the plates makes your job easier, it is still not considered proper manners. Unfortunately, this etiquette may vary by the type of restaurant. In more casual dining situations, you may see people stacking their plates for removal. In fine dining options, the server knows what to do, so plates should never be stacked or shoved away.